It has been an interesting few days for me trying to decide which product I wanted to review first. 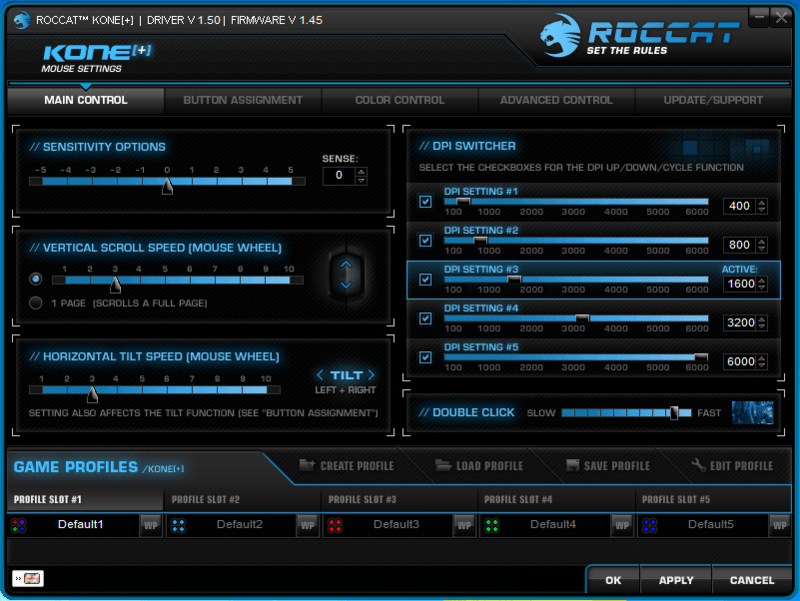 The reason I picked the Roccat Kone [+] was to do with an interest in the brand as well as the actual product. Most of you who have seen the Kone[+] about will know its a few years old by now. It still has a lot of great features to offer. The shape is pleasant to hold, and the soft touch rubberised coating feels good. The thumb rest does feel a bit strange. On all the other mice I have used the thumb rest blends into the back of the mouse. The Kone [+] has a distinct notch which feels strange at first, after trying a few different ways of holding the mouse it starts to make sense why they did this - it gives a more secure grip, especially when reaching for buttons. The cable is plastic coated and nothing special. It's long enough at 2m to reach to just about any USB port. The USB connector is really good, it has notches on the sides, so when you go to unplug it - it is easy to grip and pull out. 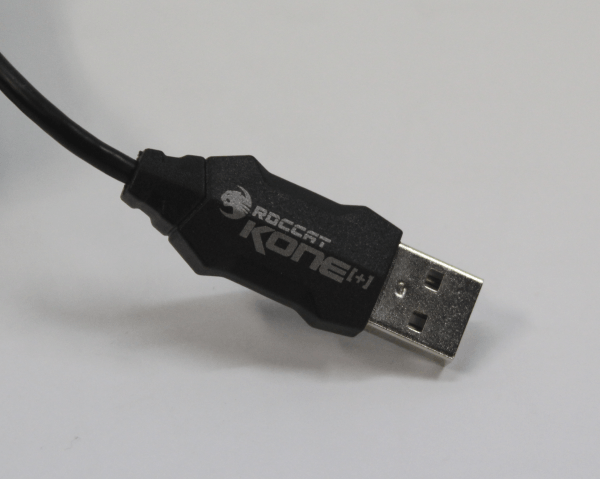 The connector even has the Roccat branding and Kone [+] printed on it, so your not going to confuse it easily unless you're reaching around the back of your system and you cannot see what your doing, even then chances are you will feel the connectors shape. Without the software installed the mouse defaults to colour cycling the lights with a breathing effect. Pressing the back button on the side turns all four of the lights blue, a nice visual indicator. The back button is referred to as button 5 in the software as well as being configured as the easyShift[+] button. 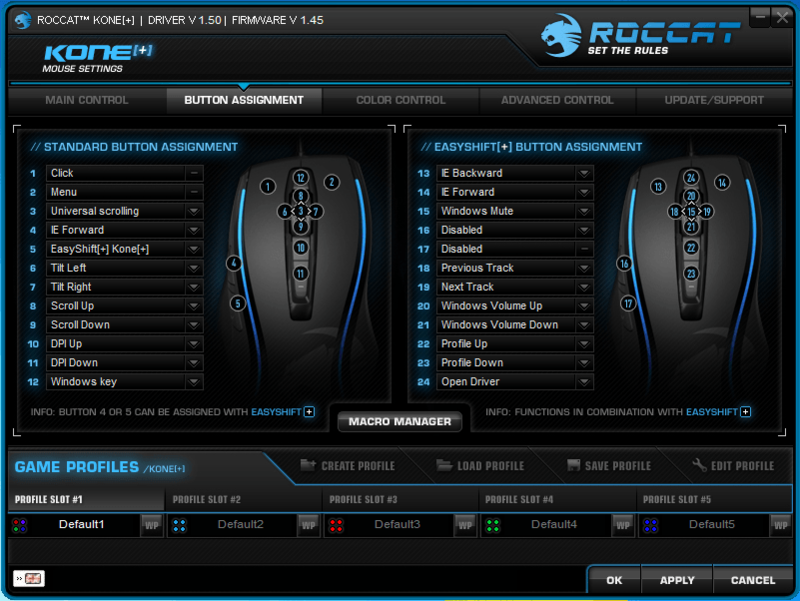 The easyShift[+] feature is a modifier which allows you to access the second layer of options on the mouse. This effectively doubles the number of macros/options you can have on the mouse. 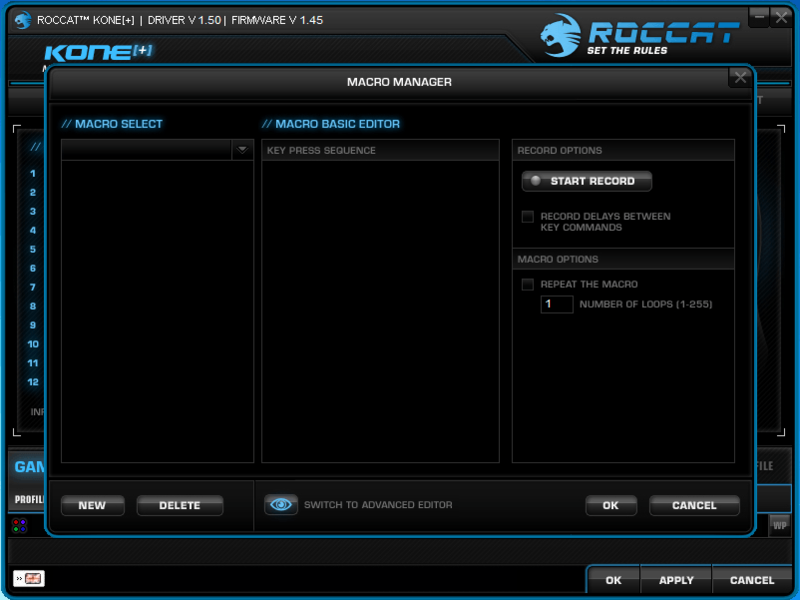 Once you install the software you can change which button becomes the modifier and what macros are assigned to the buttons. There are a large number of popular games that already have predefined macros as well as the option to edit the predefined ones or make your own custom ones. As you will see in the picture below the list of supported games covers most of the popular ones including Starcraft 2, World of Warcraft, Guild Wars, Left4Dead, Bioshock 2, Counter-Strike and many more. The button placement takes a little while to get used too but is nothing strange. It's easy to reach the side buttons which have a light feel to them. The DPI buttons are easy to reach and easy to feel which one is up and down. The wheel is solid and supports the usual scrolling and mouse button as well as horizontal tilt. 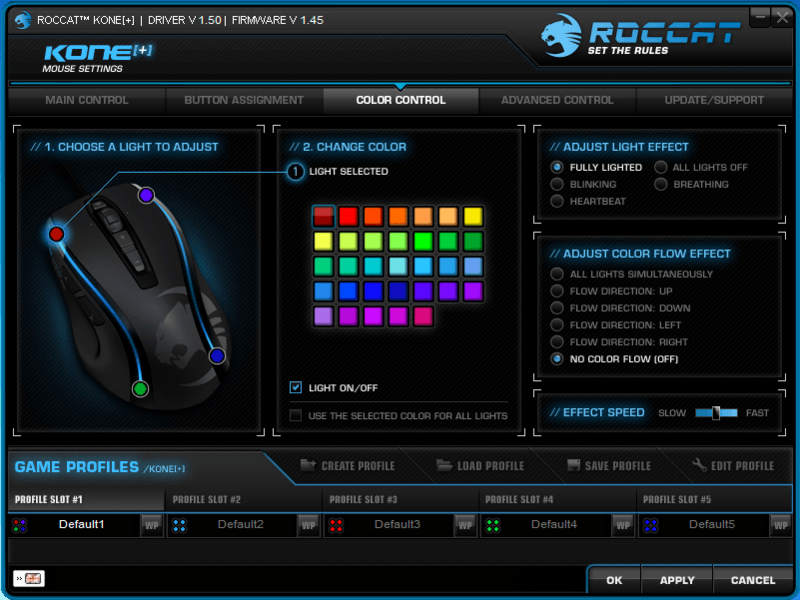 The tilt gives you a few more options when it comes to customising your mouse with macros. The wheel has a chunky rubber pattern which works well to defined the steps when scrolling. I do find it a little strange using the tilt as all the other mice I have used in the past didn't have this feature. The easier to reach buttons that don't get in the way is always a plus. In front of the mouse wheel is another button, which by default acts as a windows button - opening your start menu. If you used in conjunction with the easyShift[+] button it will launch the mouse driver software. Both the default and easyShift[+] setting for this button can be changed via software. 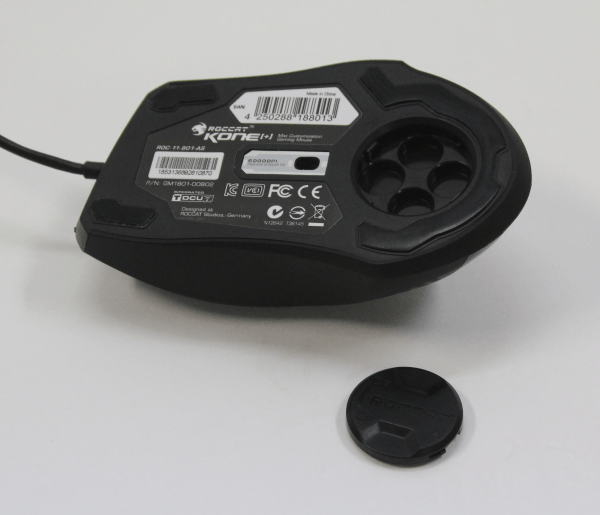 The Kone[+] mouse has a wide range of features, most of which are definable in the software. The only one that's not software driven is weight tuning. This is accessible from the bottom of the mouse by turning the circular panel clockwise. I did find this a little tricky as the indentations make it easy for you to slip. But I'm guessing you're not going to be changing weights all the time. The four 5gram weights come in a small clamshell that's easy to deal with. The weights are easy to install but a little annoying to remove, as there is no easy way to grip them. I had to be a bit rough with the mouse to persuade them to come out, probably not something you will have to deal with often. All the software features are described under the software section. The build quality seems pretty good, no sharp edges. There is a definite feel of quality, the rubberised coating gives you a solid grip. Even without the weights installed the mouse has a solid weight to it. The mouse feet are well placed, but the front ones do seem a little small when compared to other mice out there. The rear one is nice and large and wraps around the rear end of weight systems cover. The rubber used on the mouse wheel seems decent, I'm not sure how long it will last but looks to be well integrated into the wheel itself. I cannot find much to grumble about the performance. The laser sensor it working well on my grubby mouse mat (an extended Razer Goliathus speed edition), and that's before I have enabled the TCU (Tracking Control Unit). The TCU configuration can be found in the software under "advanced control" along with the adjustable lift offsetting known as "Distance Control Unit". I definitely recommend you enable both of these and adjust to your liking. 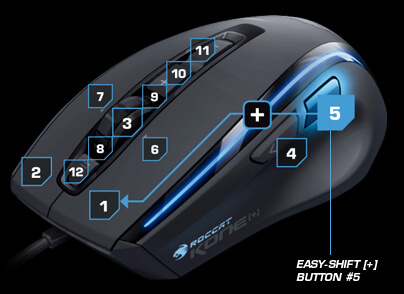 The left and right mouse buttons seem to register clicks from just about any angle, even from as far back as the DPI down button. This should register your clicks regardless of what style of grip you favour. The software is a bit on the large side for a download for a mouse driver at 62mb (driver ver 1.50 ) as well as the latest firmware for the mouse. This release of the drivers supports Windows XP 32 Bit, Windows Vista 32 Bit, Windows Vista 64 Bit, Windows 7 32 Bit, Windows 7 64 Bit, Windows 8. 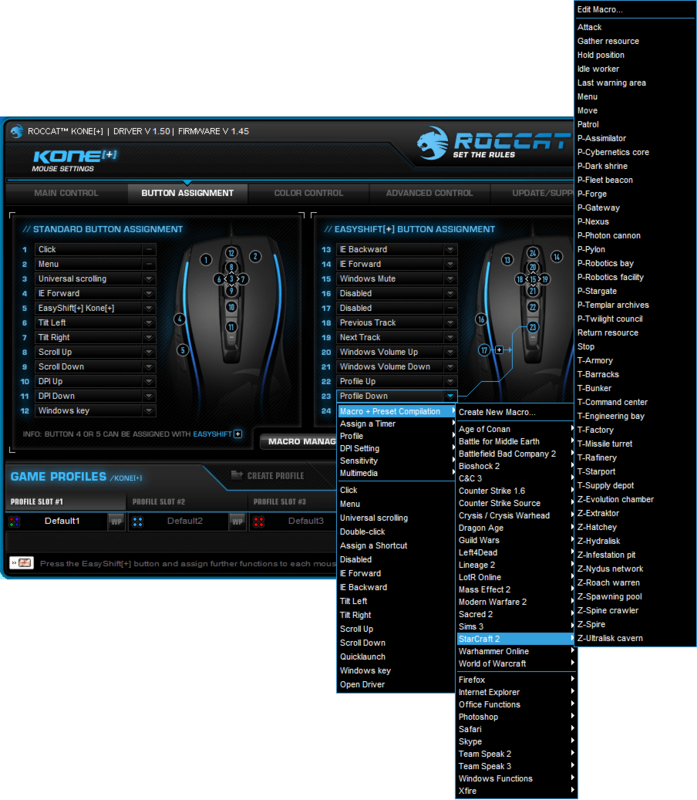 For those of you on Mac there are currently no drivers available, so you cannot take advantage of all the extra features that other platforms have - I hope that Roccat does release something in the future. Linux users are in luck, there are drivers on SourceForge. 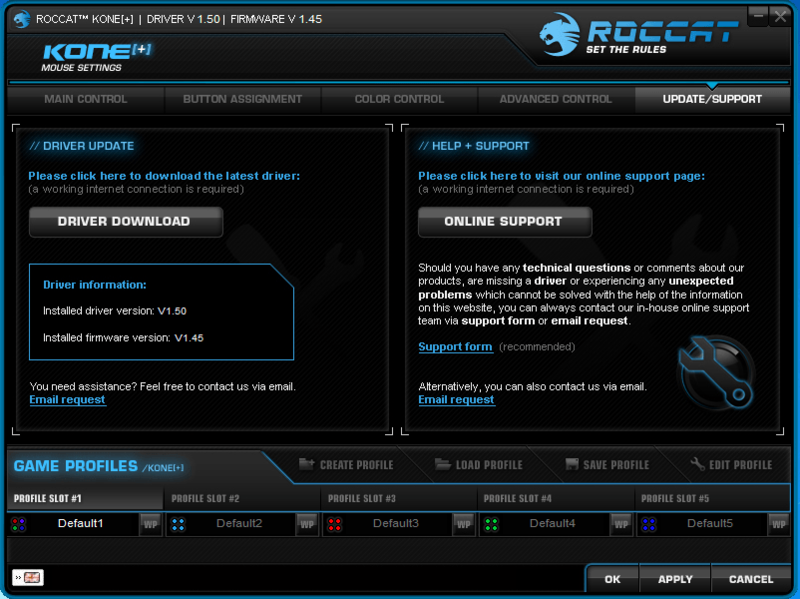 The Linux drivers are not official Roccat drivers but appear to give you a decent set of features. This should also be a great advantage to have on a Steam Machine. Installation is pretty quick under my system using Windows 7 Pro 64bit - for me less than a minute for me. On the first run of the software, I'm prompted to do the firmware upgrade. This is straightforward and is very well communicated. I'm wasn't left wondering what's happening. Once the firmware has finished updating I'm prompted to unplug and re-plug the mouse. Very quick and single. The best thing is I haven't had to restart my system once not, even after installing the software. I'm a huge fan of this, the last thing I ever want to do is restart just from installing a mouse driver. It's taken less than 3 minutes to install the software, update the mouse's firmware and to jump straight into configuring the mouse. DPI switcher - allows you to specify the DPI for each of the five DPI steppings, as well and turning off steppings if you just want to define 2 or three steppings that you want. 2. Button Assignment - here we get to program what each button will do. There are many predefined options for general use as well as a heap of defined macros for many of your favourite games. You cannot change the default action for is the left and right mouse buttons, you can assign an easyShift[+] to them. 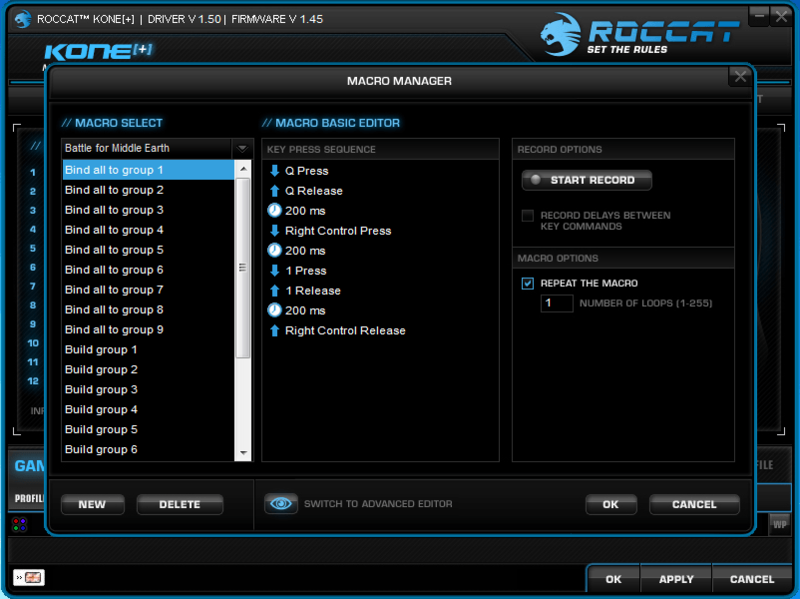 The macro manager which is accessible from here allows you to tinker with any of the predefined macros as well as create your own. 3. Colour Control - well you guessed it, you can change the lighting. You can assign an individual colour to each of the four LEDs, change the lighting effects, change the colour flow and the speed of the chosen lighting effect. Tracking Control Unit - calibrate the sensor to the surface you use. Distance Control Unit - enable and adjust the lift-off options - well worth experimenting with this. Polling rate - set your preferred polling rate - default is 1000Hz. A nice feature you will notice is the ability to disable any of the 5 DPI settings. Sound Feedback - this is a neat feature that will audibly tell you what DPI was selected, what profile you changed too if you changed the volume up or down and what sensitivity you changed. This is going to help you out at some point, especially in the middle of a game when you are madly trying to get the right DPI or the like. it could see this becoming a little annoying but you can switch off any or all four of the options. Driver Reset: resets your drivers back to factory default. a good idea for when things go wrong. 5. Update/Support - This is exactly as it says, check for driver updates and find out which version of driver and firmware is currently installed. If you have a net connection you can have it check for update and download for you. 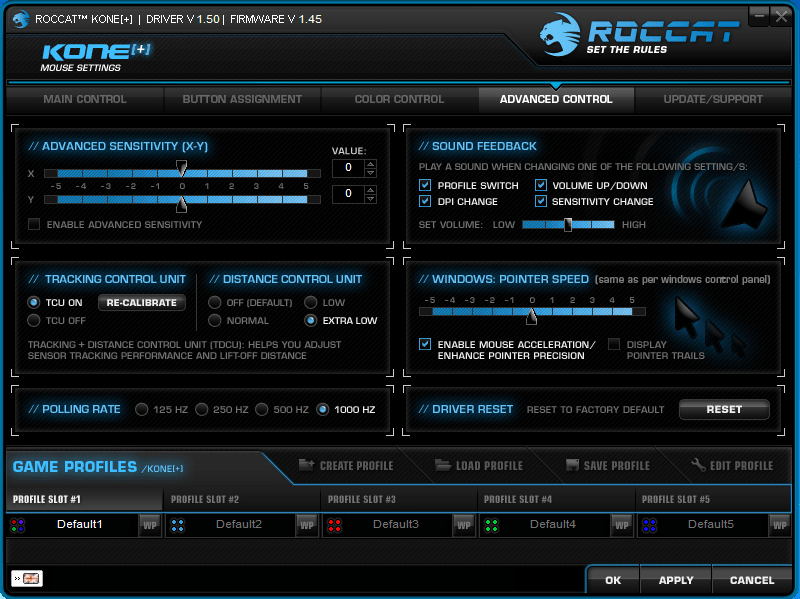 If you want these kinds of features in your mouse then it is well worth it. If you are after a solid gaming mouse that is simpler then there are other options out there worth looking at. But it is hard to pass up a quality mouse with all these features.